Magnetic refrigeration is a new technology which seem to brought the revolution in the refrigeration industry because of its advantages over general electric refrigerator. As you all know the sole purpose of refrigeration is to remove the heat from an enclosed area and place That heat somewhere else. It's a cooling Technology and In this process the magnetocaloric effect principle is used. in the system a controlled magnetic field in introduced. this system will be able to create a series of magnetization and demagnetization pattern. these patterns will create a temperature gradient in the material.. this series of magnetization and demagnetization will set a system to provide hot or cold temperature as per the requirement. This technology is developed to replace the conventional vapour compression refrigeration system because that system is very harmful for the environment as it emits many harmful gases like CFC, HFCS etc. Although magnetic refrigerators used for Industrial and research purpose. This technology is very efficient as compared to Vapour compression refrigeration system. This technology still hard to use for house purpose is because of its high cost intense magnetic field. Researches assured that in future devil make this technology to used for commercial purposes. This effect is found on a material kept in a varying magnetic field. If an object is placed on a varying magnetic field the temperature change will takes place. 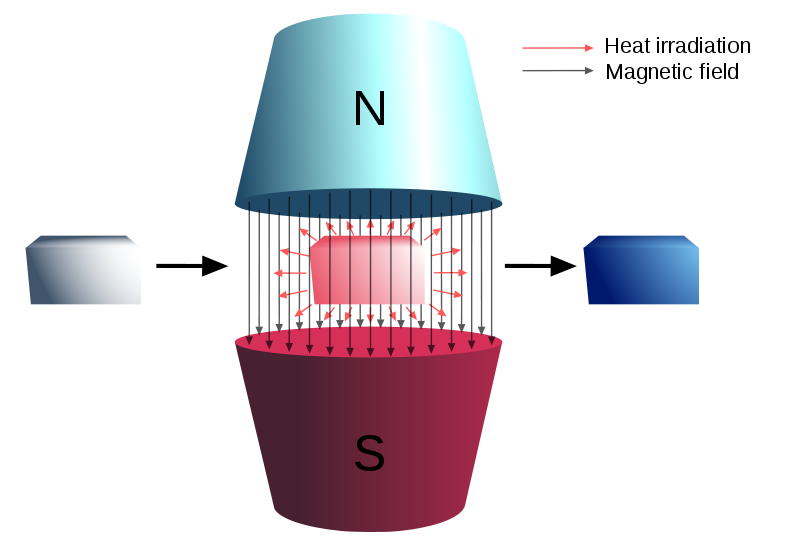 if the material is brought towards the magnetic field the temperature of the material will increase and when the material will move away from the magnetic field the temperature of the material will decrease. the maximum or minimum temperature according to this effect also depends on the properties of material. The Refrigeration cycle of magnetic refrigeration is analogous to carnot Refrigeration cycle. But the process the magnetic field varies so the strength of the system also increases and decreases. In this process of the cycle nature of the substance will increase. The dipoles of the magnetochloric material will get aligned if they are placed in an insulated environment. In this Process and entropy of the material will decrease and so as the heat capacity. The heat added in the previous process will be removed through a fluid. To avoid the heat reabsorbing by the dipoles the magnetic field will kept constant. The external fluid is introduced for this process. Once the process is completed i.e. The substance is sufficiently cool, the coolant will be separated from the system. In this stage the magnetic field surrounding to the material will be reduced. Will remain constant in this process. Because of the thermal energy the magnetic Moment will overcome the magnetic field. It will cost the material to cool. By keeping the magnetic field constant material will be prepared prevented from reheating. The material is kept in contact with the environment that is to be refriderated as the sample is cooler rough related environment, heat energy transfer into the working material. Refrigerant which has the quality of high entropy change at the working temperature this type of refrigerator type of refrigerator under the magnetic field is desirable. The paramagnetic salt is proposed as the refrigerant But the temperature above 40K paramagnetic material cannot be used as the temperature variation is very small in the magnetization process. In the magnetic refrigeration we need low temperature because the heat capacity of material increases with the temperature and the entropy change produced by magnetic field is not enough to get the required temperature variation in the paramagnetic material. Paramagnetic salt can become a diamagnetic or ferromagnetic so the lowest temperature required can be achieved by this method. The system has the ability to reduce the noise and vibration during its operation. The magnetic refrigeration system has better safety for its users because it's a low pressure system. As the system do not use gaseous refrigerant so the danger of hazardous leakage of the gas can be eliminated. The magnetic emissions in this system is very low so this is also a safety feature. The system can save the energy up to 50%. In the world changing so fast it is a need for our future to adopt a environmental friendly technology. The technology is in development phase for domestic use. As It requires low level of maintenance, it can reduce the cost of operation for the users.